Super-Auto Sativa strain, best grown outdoors. Muay Thai Auto Seeds Review. As part of Flash Seeds Super Autoflowering Cannabis seeds range, Muay Thai has something distinctly unique to bring to the table. After several trips to Thailand, those geniuses at Flash Seeds finally found just the right genetics to perfect this little baby, and the result is an Auto many people should have in our growing area. 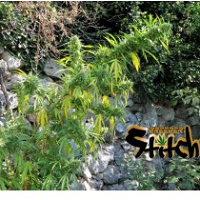 Mainly for the outdoor grower, those Thai genetics ensure a wealth of elongated, heavily frosted buds that deliver a power rarely seen in autoflowering Cannabis seeds, and yields of up to 400 grams per plant are still well within reach. Buy Muay Thai Cannabis seeds and after just 95-110 days flowering these little beauties offer the most delicious herbal flavor with hints of delicious cherry and zesty lemon on the upper notes. 19% THC and 0.7% CBD offers psychedelic motivation and creativity in a plant that can wipe away depression, anxiety and stress, leaving you feeling on top of the world. For those that want power in their Sativa without all the hassles of regular or feminized seeds, Muay Thai Auto seeds have it all.